The newfound legitimacy that street art has acquired is a fascinating sociological phenomenon. Here in Melbourne there’s been heated discussion over the council’s decision to preserve several of Banksy’s stencils under Perspex (therefore suggesting that some graffiti is legal whilst some isn’t) and, conversely, there’s been disappointment expressed when a graffiti cleanup crew accidentally painted over one of his pieces. Then there’s the fact that most street artists would argue that their medium is deliberately transient and that any attempts to preserve it are counter to the counter-movement itself. Then along comes Thierry Guetta – cousin of well-known street artist, Space Invader – who has a compulsion to film everything he sees, including the creation of street art. Ironically, the street artists he meets are quite happy to have him film them, the argument being that this transient art form needs to be recorded for posterity’s sake. His work with the handicam eventually amounts of thousands of hours of footage, some of which comprises this doco. Whilst Thierry makes it his mission to seek out the world’s most famous street artist, the film surprisingly focuses on the determined cameraman himself rather than the elusive Banksy. Thierry is a bizarre mix of dedication and immaturity. More then once, mention is made of his wife and kids who remain at home whilst he goes globetrotting, helping out the artists he meets. Whilst he never really sees the big picture, Thierry is always thinking ten steps ahead. To say that Exit Through the Gift Shop ends up surprising would be quite an understatement. The film leaves us with a very uncertain picture as to what exactly constitutes art. 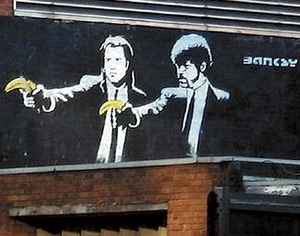 From the ninja tactics of street artists dodging the law, to the likes of Banksy making a fortune when he crosses over into the mainstream, the line between culture and counter-culture is practically non-existent. To think that one could theoretically leap from vandal to sell-out in such a short time is astounding. The hours upon hours of footage have been compiled perfectly, however some of the face-to-cameras could have been more tightly edited. It’s difficult when Thierry seems to have such difficulty expressing himself in English and ends up merely repeating the same word several times to make his point. Banksy stays hidden in shadow throughout the film, as one would expect, and his detached, vaguely pompous attitude is funny enough to escape engendering hatred. Narrated by Rhys Ifans, Exit Through the Gift Shop is a fascinating look at the street art world. It really is an extraordinary document of the subculture thanks to its subject’s refusal to simply turn the camera off.